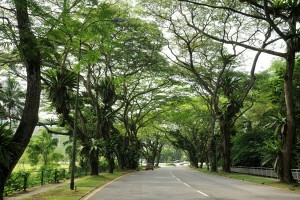 A 918m natural green tunnel lined with Rain trees and road back to Singapore's colonial past. Located near the city area, Arcadia Road is a scenic street lined with majestic Rain trees, forming a green tunnel as you run, drive or cycle through this 918m stretch of road and pavement. Along this route, you will come across the old civil service residences of Adam Park Estate, reminding one of Singapore’s colonial past. The lush greenery and huge rain trees provide runners, cyclists and other road users fresh air, shade and peace.